State College, PA – St. Joseph Institute, a faith-based addiction treatment center located in central Pennsylvania, has released a dozen publications to assist counselors and support addiction treatment. The majority of these resources are available at no cost. I Will Not Relapse (16 pages) is a workbook for people in the early stage of their recovery. It guides the user through the development of a relapse prevention plan. Among the topics covered are an assessment of why drugs and alcohol are used, managing stress, establishing goals, making changes, watching for danger signs, and identifying techniques that will help overcome cravings. 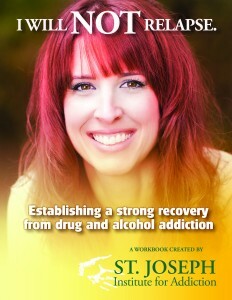 Prayers for Recovery (120 pages) is the book that was developed for morning prayer at St. Joseph Institute. There are 31 daily programs that include hymns, scripture readings and prayers that focus on themes such as forgiveness, hope, healing, spiritual growth, wisdom and truth. Support without Enabling, Understanding Motivation, 8 Keys to Overcoming Addiction, is among the articles that have been posted. The Institute finds that these are important resources for families who are often confused by addiction and unsure of their role in recovery. Redemption in Christ: A Model for Christian Counseling (60 pages) presents a clinical model that is firmly based in Christian thought. “This new model provides an understanding of the human person as a psycho-spiritual entity whose self/soul can be cultivated from a purely Christian perspective through both an intellectual knowledge of our faith and an ongoing relationship with God. The model includes an examination of the three aspects of the soul: the Being Self, the Relating Self, and the Doing Self,” stated Jenny Sheetz, author, clinical director, and founder of St. Joseph Institute.